MILLERSVILLE, PA (KTRK) -- A man faces a laundry list of charges after police found him drunk and naked in a hog barn he'd been previously banned from. Manor Township police say Larry William Henry, 64, was banned in March 2011 from ever returning to the property, but officers found him there again two weeks ago. Officers got a call about a possible trespasser at the hog barn on June 26. When police entered the barn, they found Henry inside, naked, with several market weight hogs. So why did he ignore the ban? 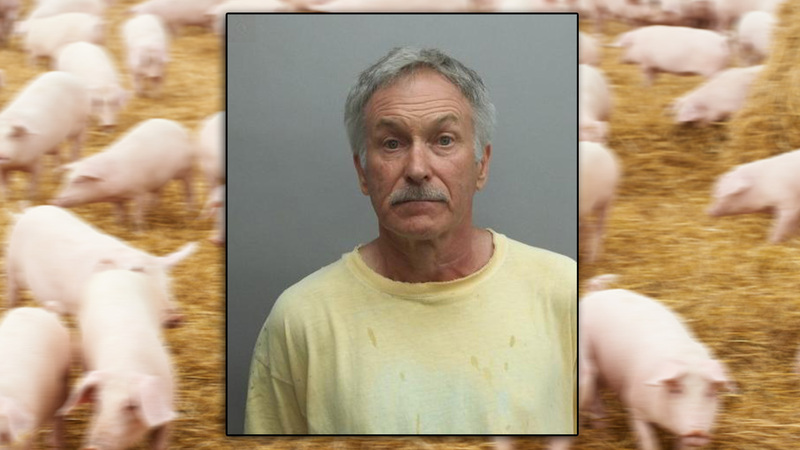 "I just like pigs," Henry told officers when asked why he was there, Lancaster Online reports. Henry also admitted to drinking a six-pack of "Hamm's beer made by Miller Brewing Company" while hanging out with the hogs. Henry is now out of jail on a $25,000 unsecured bail. He's due back in court later this month on charges of indecent exposure, criminal trespass, defiant trespass and public drunkenness.